For the first time ever, the Southeastern Archaeology Conference will be in Tulsa, Oklahoma on November 8-11 at the Hyatt Regency Hotel in Downtown Tulsa. Its so close, this might be your opportunity to attend the premier regional archeology meeting for the southeastern United States. Modern Tulsa is within the boundaries of the Creek, Osage, and Cherokee Nations but is surrounded by many of the Nations of the Southeastern Tribes and we are hoping for a greater attendance from those communities. 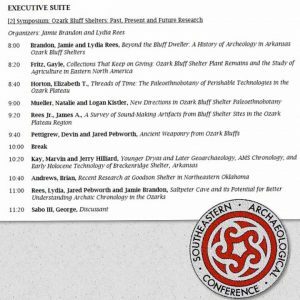 The Arkansas Archeological Survey will be well represented at this year’s conference. Two symposia have been organized–one honoring the 50th anniversary of the founding of the Survey and one about bluff shelter research in the Arkansas Ozarks. Not to mention Survey staff giving talks in many other symposia. We are excited about our bluff shelter symposium entitled “Bluff Shelters: Past Present and Future Research.” Ozark bluff shelters are an incredible archeological resource providing both deep, stratified deposits and often the preservation of perishable materials. As we are rapidly heading toward 100 years of archeology in Ozark bluff shelters, it is time to take stock of this class of site and attempt to summarize the history of investigations, discuss current work and to contemplate the directions that future archeological inquiry may take. The symposium will include large overviews of the archeology (Brandon & Rees) and paleoethnobotany (Fritz and Horton) in bluff shelters as well as looks at future directions in research (Mueller & Kistler) and case studies of current bluff shelter research (Rees, Petigrew & Pebworth, Kay & Hilliard, Andrews, and Rees, Pebworth & Brandon). Dr. George Sabo, Survey Director and author of Arkansas Rock Art will be our discussant. We hope to turn this symposium into a addition to the Arkansas Archeological Survey’s Research Series next year.